I want to thank everyone for the most warm and gracious welcome that I received upon my arrival in southeast Alaska. I am grateful to everyone who traveled from near and far to attend my ordination and installation as the 6th Bishop of the Diocese of Juneau. I extend a special word of thanks to all of those who prepared the ceremonies, receptions and guest services: the staffs and volunteers from the Chancery, the Cathedral and St. Paul the Apostle Church. A lot of hours were offered and volunteered by so many to make the celebrations prayerful and joyful. I am enjoying these first months of my ministry. It is a joy meeting so many wonderful people who make up our local communities in Southeast. I had the opportunity to travel to Sitka the week after the ordination. I spent several days visiting St. Gregory Nazianzen parish and the city of Sitka. Father Andy Sensenig, OMI and Father Peter Gorges were gracious hosts and made sure that I received the full tour of the parish and the local community. The following weekend I traveled to Ketchikan where I received a special welcome at the airport from the first-grade children of Holy Name School, followed by a tour of the school and a special school lunch of hotdogs, chips and popsicles in honor of my mother. 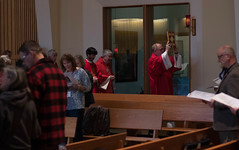 That was just the beginning of several days visiting Holy Name parish and, like in Sitka, Father Patrick Travers made sure that I met just about everyone. In early November, I traveled to Ithaca, New York to celebrate with my family who were not able to attend the ordination in Juneau. Although I am originally from southern California, my parents were from upstate New York. It was one of the joys of my life to return to the church of my baptism, Immaculate Conception, to celebrate the Eucharist as a bishop with my family, and the local parish community who hosted a reception following the Mass. I then made my way to Baltimore to attend my first meeting of the United States Conference of Catholic Bishops (USCCB). During the last two weekends in November, I spent one at the Cathedral of the Nativity of the Blessed Virgin Mary, and the other at St. Paul the Apostle Church, both here in Juneau. 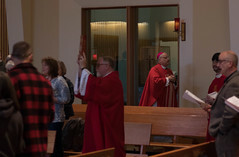 While I have celebrated occasional Masses at both parishes, this gave me the opportunity to celebrate all the Masses and to meet, once again, just about everyone. At the Cathedral, we had receptions after each Mass and at St. Paul’s the Knights of Columbus provided a delicious pancake breakfast. I extend a special word of thanks to Father Pat Casey, OMI and Father Mike Galbraith for hosting me. In the New Year, I look forward to visiting all of our parishes and missions. As we begin the Season of Advent please be assured of my prayers for you as we await the coming of our Lord. May our good and gracious God bless you with his love, peace and joy! +Most Reverend Andrew Bellisario, C.M.